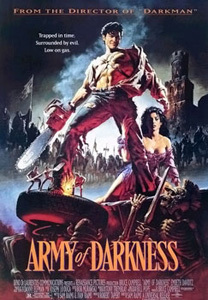 The Evil Dead III: Army of Darkness is a strange mixture of horror and comedy which again sees director Sam Raimi and actor Bruce Campbell re-united with the deadites for some more fun. Ash is cast back in time for a zany adventure which leans more towards comedy than horror. Our chainsaw armed, shotgun wielding, madman of a hero stumbles his way through the film but never faces anything as frightening as in the preceding films. In keeping with its prequels the film flies by very quickly, a horror comedy brought to life by the physical and mental humour of the leading man and the skill of the director. It is funny, exciting and highly original but it isn't scary.